In my blog on The Key Elements To A Proper Heel, I discuss in more detail what you need to do in order to get your dog heeling. Why Are Retractable Leashes Bad For Working With Your Dog? Why this is important is anytime the owner has a retractable leash, there is generally no structure to the walk, whatsoever. Meaning the dog is generally walking ahead, cutting behind, cutting across, pulling out more leash, and just wondering all over the place. -It often times to lead to improper greetings with other dogs, which can lead to a dog fight or altercation. If another dog is coming while walking your dog on a trail, they can take off running and get 15+ feet momentum to run over to the other dog. This can cause for an improper/uncontrolled greeting with the oncoming dog can interpret wrong, causing an altercation between the two dogs. -If your dog is a prey-driven animal, and they see a squirrel, cat, rabbit (etc), they can take off running at full speed, the retractable leash gives them 15+ feet of momentum and speed in order to drag you to the ground. We hear these stories on a daily basis at our dog training facility in Northern Virginia. If you take the same dog and put them on a 4′-6′ leash, they do not have enough ground in order to get their speed and momentum going which prevents them from being able to pull you down. 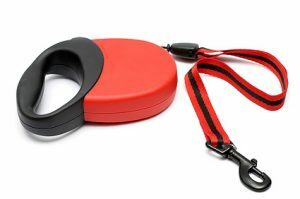 -A lot of people have received rope burn from these retractable leashes. Almost every retractable leash has a very thin leash. If this thin leash gets caught around your hand, leg, ankle (etc) and the dog takes off running at a high rate of speed, this cord can cause sever rope burn. In summary, if you have a retractable leash, do yourself, your arm, and your dog a favor and get rid of it. You can look at over 400+ of our videos on our YouTube Channel if you want to see what a structured, disciplined, a controlled heel looks like with training.